Even the prisons of Bern make for an attraction in the city. Isn’t that so unique? The Prison Tower locally known as Kafigturm is the cornerstone of Bern’s history. The work of the old tower was initiated in 1256 but the tower was only erected in 1344. The clock was put on the tower in 1961. The tower changed its purpose of service in 1999. The tower now often hosts exhibitions relevant to the history of Switzerland. As the tower stands right in the center of Bern, you definitely can’t miss it. If you are inquisitive about this beautiful country, start at the Prison tower to get your heap on historic information. Be careful as the stairs to the top of the tower are steep. Get to the top of the tower to witness to breathtaking view of the city. How popular is Prison Tower? People normally club together Child Eater Fountain and Old Town Bern while planning their visit to Prison Tower. Excellent location. Nice seating arrangement. Not a very big hall but good enough . Originally a gate house of mid 13 century medieval Bern, demolished and rebuilt 400 years later. 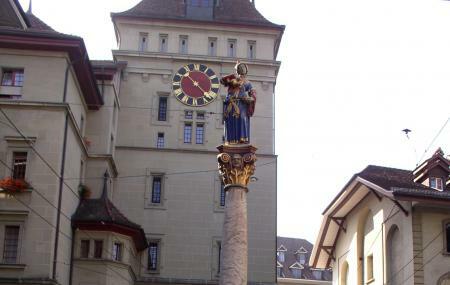 The 50 m high tower is now a distinctive landmark of old Bern on the same street where the Zytglogge is. Trams on one side of the street pass through the tower itself. Although the Kafigturm is rich in itself but the Zytglogge is more overwhelming. Located in the heart of Bern, this tower is a Swiss Cultural Property of National Significance. The original tower was demolished and this new one was built in the first half of the XVII century. If you walk on Bern's main street there is no way you can miss it! Just be careful when you stop to take pictures because there are a lot of trams and buses going by.